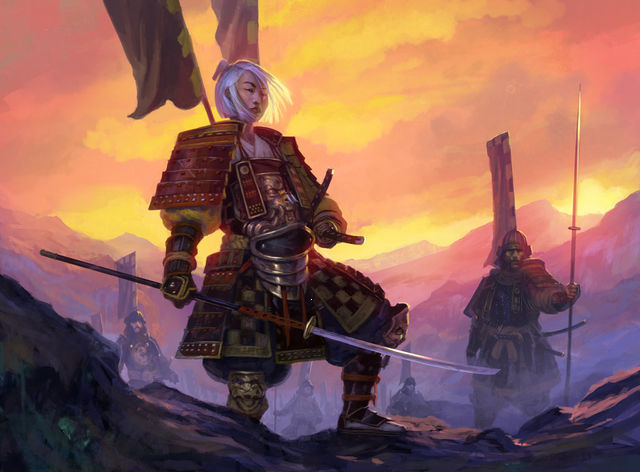 This article is much more of a memoir of the evolution of my own ideas on the Lion splash Scorpion deck, in the several different forms it has taken, based on both the meta and my play-style, along with some comments that some might find useful. Anyone interested only in the ideas that lead to this particular deck as well as tricks and tips, please skip to the end. 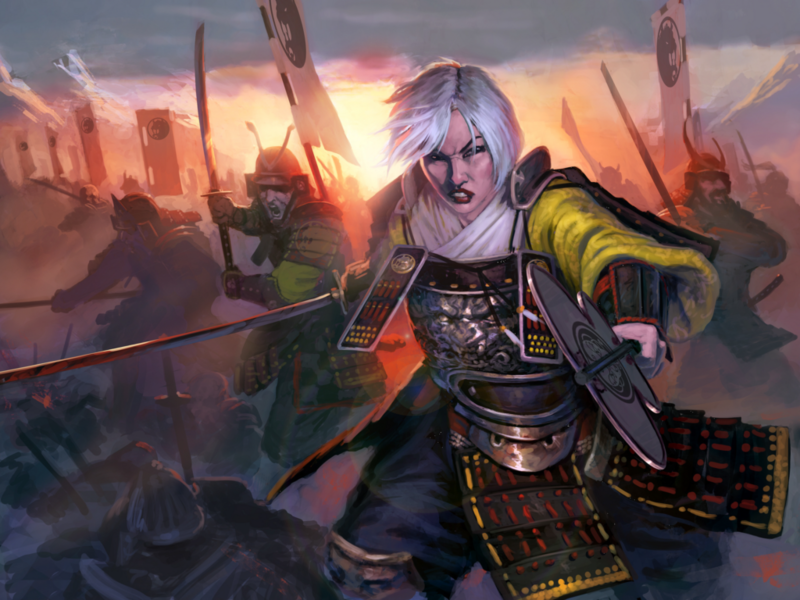 This article is not a new “State of the Game” in which I explain issues that I find the game to have, either in its core mechanical structure or card design. I have been too verbose on the matter in my previous article, as well as in person in the several Koteis I have attended. This article is not “How to Lion”. This article is “How I Lion”. Now, that this is out of the way, let’s see how we got here. It is autumn of 2017, the game has just come out and everyone tries to understand what each clan is all about. 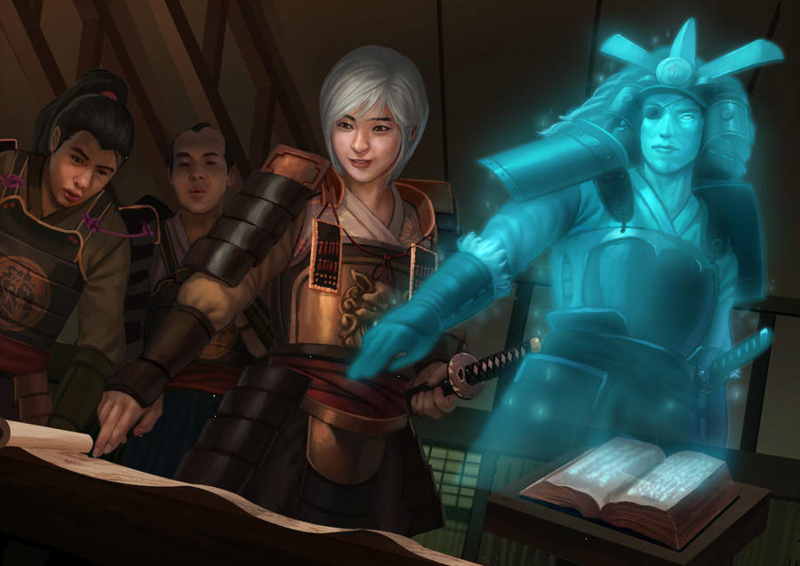 After the first cycle was printed, the meta is defined by Mirumoto’s Fury, Forged Edict, A Fate Worse Than Death, and Policy Debate (more on this first era can be found in The State of the Game). 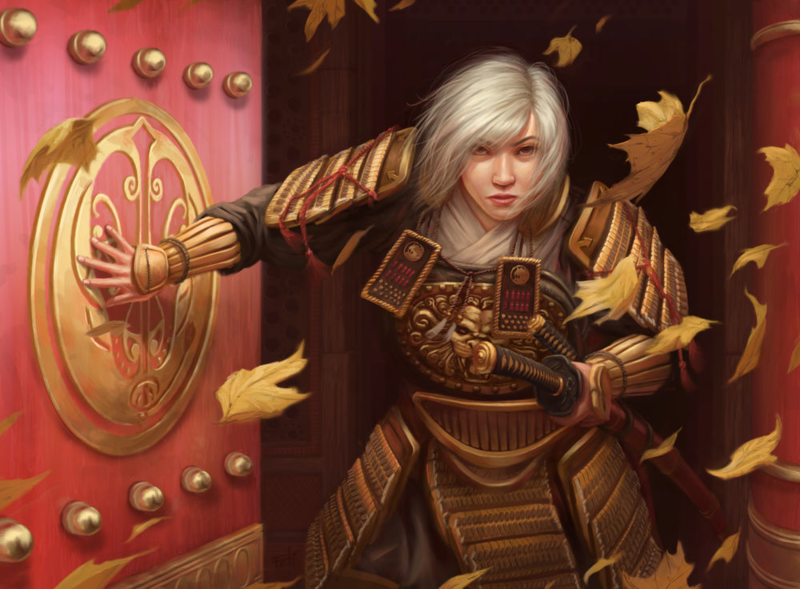 Ikoma Ujiaki: a medium stated 5-fate character that has relevant traits, namely Bushi (which was still relevant, as For Greater Glory was not restricted) and Courtier (For Shame and Edict are staples even in Scorpion today). 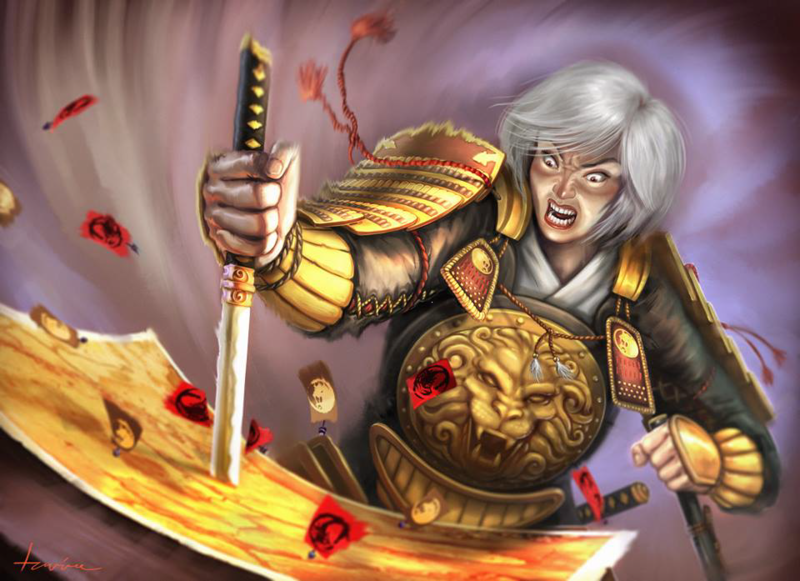 Ageless Crone: A political tool that needs a lot of work before a player can master it, as it requires banking fate to threaten to play cards during the conflict she enters and FFG has decided that Lion are supposed to spend all their fate in Dynasty to be relevant (since yellow conflict cards are bad). Implacable Magistrate: An excellent tool that hands-down wins games against certain clans (i.e Crab), a staple 1-off to every deck that runs Spiritcaller. Legion of One: An actually good Lion card. Restricted to be played during military conflicts only, as most yellow cards are relevant to be. And that is all. One would argue that Goblin Sneak was added as it synergizes with Legion, but that can be splashed in every clan’s deck. Autumn 2017 : Why Scorpion? In this environment, and with my position that the 3 strongest card effects in this game are: Character Removal, Event Cancellation and Attachment Removal, the obvious choice that everyone splashed was Dragon, for Mirumuto’s Fury and Let Go. I chose otherwise and ran Stinging Cats, tapping into some Edict, Favors, and Swim action. The problems I encountered with that version of the Scorpion Splash are mentioned in my report in the link. In a nutshell, the problem was that one cannot dishonor their own characters with Edict, Favours, Court Mask, while their -Scorpion and Crab- opponent dishonors them, too and expect any positive results. 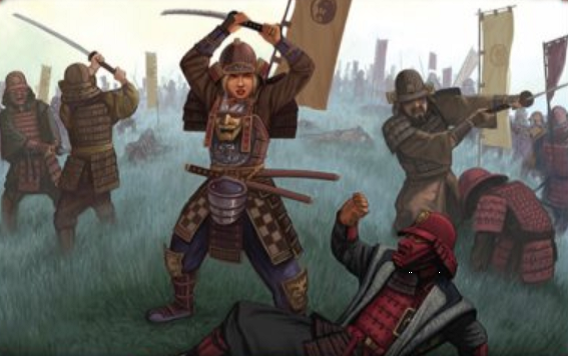 A brief note on the fact that Mirumoto’s Fury, A Fate Worse Than Death, Forged Edict, Policy Debate, Let Go, and Calling in Favors were all in the same deck, No Funny Stuff – Scorpion Sub Dragon back in the day when playing second not only meant you controlled the aggressor’s wasted resources on their attack using your provinces’ actions, being first to gain fate from rings on turn 2, but also you were compensated for playing second with an extra fate. For better understanding, please read the great Bayushi Akai’s deep theory craft article Defensive Dishonor Theory). After trying out several Scorpion Splash builds for Warsaw (like More Stinging Cats)), I realised that I had to make a statement, so I jumped on the bandwagon of Dragon Splash, ascended to Hatamoto status, hopefully proving that even an “angry madman” with half a brain and some strong cards can easily become top of clan Warsaw Lion Hatamoto. As stated in the comments, “the deck is not very inspiring..” but there are some intriguing (and by now, obvious) tricks enclosed in the comments for anyone interested. Having made my point, I returned to my long-standing mistress of the Scorpion Splash. Maybe I was trying to beat them with their own tools. Maybe I enjoy my yellow with a tint of red. Meanwhile, the cries and groans of the community were heard and these cards all found their way to the original Restricted Listed. It was all fun and games and the game seemed to and a way to stop the problem at its root. Sadly what your truly, like a new Kassandra, foretold, came to pass: “A more daring approach could be the super-mega-skyscraper with first turn-pass, second turn, one or two people with 3 or even 4 fate on and several protective attachments” and we saw MindsDesire put 3-4 fate on a Raitsugu, blasting him with attachments and Fingers and showing them to us all. Giving the one clan with the single best attachment removal that will ever be printed in the game the only relevant Clan Seal Keyword, with incredibly strong supporting cards, in a format already favorable by their own stronghold (which is relevant to be used in all four conflicts of a turn) just feels wrong. But, I digress and I promised to focus on Lion. It is the summer and the new 6-in-6 Elemental Cycle is released. The Lion get Ikoma Ikehata and Tireless Sodan Senzo which is brilliant, and more relevant than the former, as he requires that we win conflicts, let alone political, while she works on our strength which is losing, in this environment. But this is not the Akodo Casino (the Lion discord channel) so I’ll refrain from using that much seasoning. Early in Autumn 2018, I realise that most YnS conflict decks include Lion cards with total influence less than any keeper splash, while tinkering with Primal Guillotine, an honour and card pressuring build, attempting to suffocate the opponent, forcing parity in the quality of our respective conflict cards in hand. Deck felt awkward and lacking direction. Yet, it appears to have inspired the brilliant Akodot1 to build his Support of the Scorpion deck. Interesting comments can be found in this decklist, so please go ahead and read them. Important point: I still think that the inclusion of Yogo Kikuyo back then was suboptimal, as Against the Waves was still on the Restricted List. At this point, I started spending maybe too much time in the Casino and I started to lose faith in both myself, the clan and the game. I needed to regroup. After staying away from the game for about a month, and being still undecided on whether I would attend Cork or not, I went back to my roots and asked my old-game teacher and friend Ikoma Nakezuma (Dimitris Melissinos) for sparing and guidance. Meanwhile, the salt in the casino was growing, so I decided to take initiative, contact Philippe-Andre Pelletier and ask him to theory craft with me. The first AkodoT1_Hato decklist looked like this. It was a crude, unrefined effort to get rid of opponent’s cards utilising the Keeper of Earth role, Ikehata’s reaction together with Spies at Court and recursion from the Court Mask and the Adept of Shadows, while the Apprentice’s reaction fed our hungry hand with cards while pressing on honour. Our big reveal was the Night Raid that no-one expected to see under the stronghold, especially after that tight card pressure throughout the game. In a world that Lion generate 9 fate a turn, this decklist would shine but Lion are poor and we need every single bit of resource. 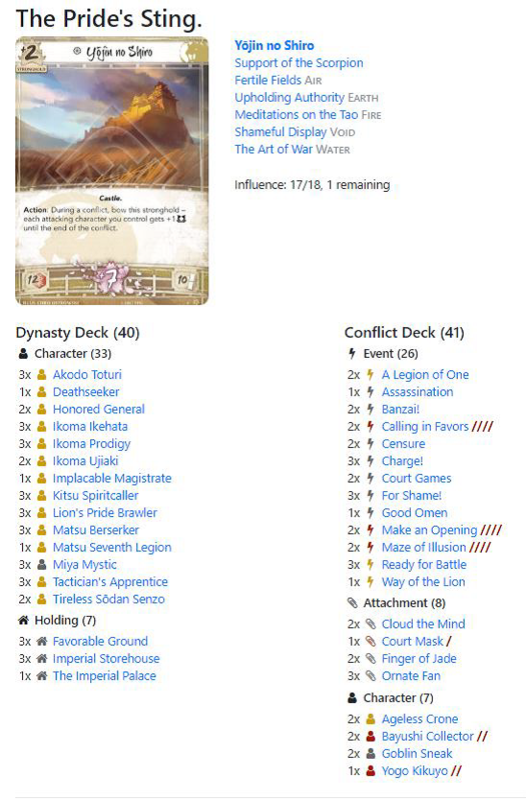 It was then that we agreed that Way of the Lion is nothing but a mediocre Banzai for this deck and that it often was redundant or even that it lacked targets (on Lion’s Pride Brawler it’s a +3, on most it’s a +1 and the Toturi argument is a win-more one that I will leave it for FFG and their love for win more cards for Lion). Mine and Philippe’s experiences with this deck were very different. Where I felt this deck had potential, Philippe was getting often stomped with it. With less than a fortnight to prepare for Cork, I felt rather discouraged at the whole endeavor. I took out the Adept and the one Court Mask. This left me with 2 cards and 4 influence worth of Scorpion conflict cards. No matter how I tried to work my way around it, I could not find a meaningful inclusion. On top of that, the deck felt random and inconsistent. The surprise factor of the Night Raid is lost in the Kotei environment after round 2, yet even then, it works as a Rally to the Cause + discard a card. It forces the opponent to attack with just one character, bounce off and then attack again to try break. That wasn’t enough. Not for Lion, where we are. With less than a week for Cork, I was annoyed at the fact that my opponents on Jigoku seemed to know by now most of my tricks. I knew that word is out and I had to reinvent the wheel, if this cart was to run. After several games with Melissinos and his Make an Opening/Maze of Illusion shenanigans, I felt there is more to be done with bidding dials and honour pressure. Support of the Scorpion felt wrong, keepers are +2 in a military conflict with the stronghold, or a mighty +7 with just one Legion of One, while the whole idea of card and honour pressure goes away, yet the 2 cards and 4 influence I was missing, continued to bug me. I started thinking about the support direction from a different perspective. Keepers are nothing but a win more card. We can’t afford to play such cards, even if CotE will bring more because simply put, we can not win. Occam’s razor indicated that the role was wrong. On Thursday morning I packed my bags for Cork, picked up my binders and decided to build a deck in Ireland. On the flight to Dublin, I decided to play Support of the Scorpion. That allowed my 4 floating influence to become 9 and the direction was now clear: Maze and Opening. Even knowing that I play those cards, my opponent in a military conflict cannot “read” whether my Maze will be 1 or 2 to his 5 (or vice versa). So my Opening will win me the conflict and YnS can boost any remaining difference. An Opening at hand, with an Apprentice on the board can allow me to bid as low as 2, draw 3 to his 5, pressure for a 6 honour swing and a 3-skill swing in a political conflict (where answers are scarce). I felt like there was something there. Oh, how I envy the Crab and their reprieves. Good omen is such a fine answer to a Water Ring attack to bow my no-fate LPB or Toturi, especially when everyone needs to play Cloud the Mind, and thus everyone needs to play Shugenjas which leads to almost everyone splashing Phoenix for the unrestricted Against the Waves as well as the free recursive 3/2 body that Ningyo is. 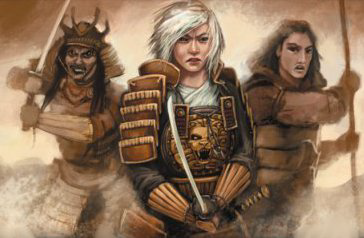 I knew I needed Ready for Battle for my Spiritcallers and Kikuyo would deal with their straighten efforts, but I wanted more. The answer came in the form a 1-off Good Omen. A card many would characterize dead in a conflict. I probably would agree, if I weren’t playing Legion of One. Yes, I Omened my LPB to give +6 to bow a massive body. On a different match up, I Omened my Toturi before a proxy conflict’s Ring resolution would bow him. I knew that I was playing my weaknesses and not my strengths with the Fans and the Masks and that I had to re-invest in Lion as they are build, whether I disagree with that or not. Adding Berserkers in the place of Keepers and removing 1 Ujiaki and 1 Senzo for a Deathseeker (for the Spiritcalling threat in a losing offensive conflict) and a 7th Legion purely for the stats, resulted in my opponents now knowing how much to invest and whether I wanted to win the conflict or lose it (options often stemming from the result of a Maze of Illusion). The Court Mask is an obvious Bayushi Collector switch, as was Spies at Court, though having to win a political is often challenging and the approach is to have no “win more” cards. Goblin Sneaks had to come in to take advantage of Legion of One, now that the keepers were removed, and provided an excellent counter for those turns that Ageless Crone taxed the opponent’s events. The Master of the Spear was proven to be far too expensive for its limited action and was replaced by the Goblins. Finger of Jade has always been in my decks, even if the play-style is not towering, as it allows resource deprivation plays. A favourite splash of many is Crane for the Steward/Shame combo and a well-timed Finger of Jade stops it. So it does for Kharmic Twist, Noble Sacrifice and I Can Swim. These considerations lead to The Pride’s Sting. It is not refined, it is not polished and I’m sure given more time I would have made a far better job. Still, it’s what gave me my second Hatamoto title and I believe there is some basis there. Had I more time I am positive I would have included a Peasant’s Advice, as a costly Sabotage to get rid of the Districts. It also switches Collectors on, while peeking for that Restoration of Balance sounds like a lovely addition to this deck. Show weakness where you are strong. To my fellow Lions I have to say to never stop innovating, training and strategising. This question can easily be answered by making reference to cards like Kitsu Warrior, Beastmaster Matriarch, Writ of Authority, Test of Courage, Even the Odds, as well as the long list of 2-fate 2/1 with 2 glory and the general counter-synergistic aspect of yellow cards. What is more, Dan, the new Lion Hatamoto has presented this extensive – but not exhaustive – list of reasons on on why yellow cards are bad Declawed: A Look at the Competitive State of Lion in 2018 (By Handsome Dan). I also believe Kikuyo was worth including to hit the clouds everyone is running and you want to protect your key lion characters from it. Yogo Kikuyo’s reaction is restricted to events, so she can’t stop Cloud. Do you mean that she enables you to play Cloud more consistently?